What Is the Difference Between a Red-Nose Pit Bull and a Blue-Nose Pit Bull? A pit bull can only be called by one name: an American pit bull terrier. At times, pit bulls are confused with other terrier breeds. Many people are confused not only about which dogs can be classified as pit bulls, but also about the differences between pit bulls with red or blue noses. American pit bull terriers are muscular, medium-sized dogs with above-average athleticism, strength and gameness. They were bred as hunting and working dogs. 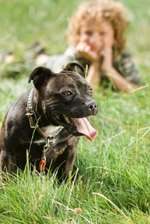 Although some breeders unfortunately breed them, against their nature, to be combative with other dogs, pit bulls are loving and loyal. Many lines of the American pit bull breed exist. Due to breeding, many color variations have arisen within the breed. Their breeding, though, was not meant to enhance appearance or color; pit bulls have, and largely still are, bred for working purposes. Among the color variations are the Colby line of pit bulls, which are brindle colored, grey with blue noses or red with red noses. Pit bulls of almost every other color exist, as well. Having a red or blue nose doesn't mean the pit bull is rare. Beware of breeders who try to pass off red or blue noses as special and thus charge more money for the dogs. A blue-nose pit bull is a dilution of either many lines of black pit bulls or of the interbreeding of black and red lines. It is unclear where exactly the blue color originated or if it was intentionally created by breeders. The general consensus is that the blue-nose pit bull resulted from chance breeding. Its coat is a deep blue-gray, at times with white patches on the chest, legs, or muzzle; and the eyes are a light color. Red-nose pit bulls can be traced back to the Old Family Red Nose strain of pit bulls that originated in Ireland. While it is also hard to trace the exact evolution of the red-nose trait, it is generally believed to have started in Ireland and kept alive by careful breeding of the original carriers of the red-nose genetic trait. These dogs will most commonly have red coats, at times with white markings and light brown eyes, although other color variations do exist.